As the days get shorter, and the leaves start changing, you may be tempted to light a fire in your wood burning fireplace. While it’s enjoyable to sit and relax by a nice, warm fire, if you haven’t had your chimney inspected or cleaned this year, I would recommend holding off. September 30 – October 6 is National Chimney Safety week. On average, 20,000 chimney fires occur in the U.S. each year. With proper inspections and cleaning, these fires can be prevented. 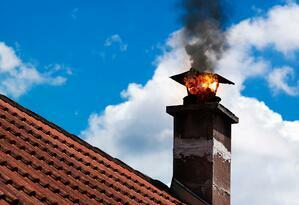 Neglected chimneys can destroy your home or injure your family. While some chimney fires burn wildly out of control, others can burn discretely without you ever knowing. Slow burning chimney fires may not be visible, but still can cause damage to your chimney or home. Smoke seeping through mortar joints. An inspection by a certified and reputable company will be able to explain what’s going on with your chimney. 1. Creosote buildup. Creosote is a residue that travels up your chimney and builds up on your flue over time. In fact, some creosote builds up every time a wood burning fireplace is lit. If that residue isn’t properly cleaned out, the chance of a fire igniting in your chimney increases. 2. Clay flue liner defects. Over time, liners can crack allowing hot gases to escape. If the hot gases enter into the home, it can cause nearby framing to ignite. 3. Improper maintenance. Cracked cement in and around the fireplace can cause hot gases to escape as well. 4. Improper installation. Proper installation is critical to keeping your family safe. The National Fire Protection Association, fireplace manufacturers, and the venting manufactures have recommended guidelines for safe and proper installation. Inspect the burner for clogged holes. If a burner hole is clogged, turn off the gas and clear the obstruction(s) with a pin or small needle. To learn more, download our free eBook, Chimney and Fireplace Safety Guide. If you think your chimney is on fire, get out of your home immediately and call 911. Depending on the type of fire, it could spread through your home quickly.